Whether you’re sending Mother's Day flowers to Edinburgh from Ireland or you need to send a birthday gift to Sydney, Direct2florist aims to make it as easy as possible. As well as offering the very best floristry and unbeatable value for money via its network of local florists, Direct2florist has an aim to make the flower sending process as simple and pain free as possible. That includes providing plenty of choice when it comes to payment method. You want to pay by Visa, Mastercard or Maestro? You got it. Prefer to use PayPal? That’s no problem either. 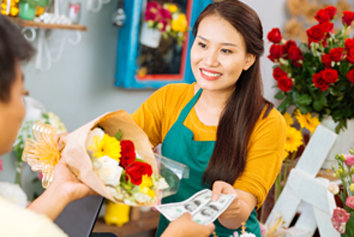 What’s more, our intelligent payment system allows you to pay in your local currency, meaning you won’t be paying the commission charges that were levied by our bank in the past, ensuring even better value for money when ordering from Direct2Florist. This reinforces our belief that there should be no hidden charges whatsoever when ordering flowers through us. Our simple and straightforward order processing system will guide you through every step of the order process, right through to payment, where you’ll be given a clear choice of your preferred payment method. Direct2florist’s ordering and payment system is as safe and secure as possible, using the very latest online security and encryption technology, meaning Irish customers can reliably use Direct2florist to send flowers worldwide What’s more, all information submitted during the order process is encrypted to ensure your personal and sensitive information is kept secure. So, next time you want to send flowers from Ireland to Australia, New Zealand, USA, Canada, the UK or wherever else in the world you need flowers to be delivered to (or just down the road for that matter), you can choose how you pay while we ensure it’s safe and secure.